Urethane Pulleys ? You’ve come to the right source! Polyurethane Pulleys with Steel Cores: Polyurethane pulley steel core are custom cast to produce pulleys for any industry requiring a high-performance material with a long service life. Since polyurethane is FDA compliant – polyurethane pulleys with a steel core can be easily reproduced for low-cost replacements and can be cleaned using most chemicals. Urethane Sheaves and Pulleys: Urethane sheaves and pulleys are frequently used to protect steel cables for lifting applications. Urethane has a great ability to absorb vibration for a smooth and quiet operation. Urethane sheaves pulleys are commonly found in elevators and amusement park rides. Plan Tech specializes in custom urethane sheaves and pulleys for any environment. Urethane Molded Pulleys: Urethane molded pulleys coating increase equipment performance and longevity by offering a variety of options. Depending on the application a variety of types and durometers of urethane molded pulleys can be cast to meet any need required. Urethane Feed Ring Pulleys: They offer long service life, high-performance ability and absorb noise better than products made from other materials such as rubber, plastics and metal. 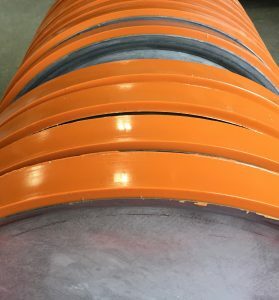 Our urethane feed ring pulleys also offer other benefits such as strong abrasion resistance, wear resistance, elasticity solvent resistance first-rate tear strength. It is, therefore, safe to say that we are specialized in producing urethane feed ring pulleys that are of top-notch quality from design to the finished products or parts. Plan Tech can also manufacture any type of core needed for high strength cast urethane pulleys applications. FDA approved urethane sprockets and polyurethane gears are also available with our cast urethane pulleys including metal additives for easy detection in existing x-ray equipment. Often times customers will alter the hardness of the urethane to alter a custom application, at Plan Tech we offer urethane from extra soft 20A to rock hard 75D. This allows our customers to tailor their equipment to special applications. If you need to duplicate existing cast urethane pulleys or strip and recoat a worn out pulley we can reverse engineer your existing OEM cast urethane pulleys for often times less than OEM replacements. Common size diameters from ½” to 6″ with face widths from ½” to 6″. Whether you are a start-up company or global leader, we can add value to your cast urethane pulleys with our strong engineering support, polyurethane suppliers expertise and constant focus on meeting all delivery requirements. Our rapid prototyping capabilities have also received particularly positive feedback. We frequently go from “Print to Part” in 10-15 business days. This capability allows our customers to rapidly develop new products and meet the ever-increasing requirements for speed in the marketplace. Whether you are a start-up company or global leader, we can add value to your products with our strong engineering support, polyurethane molding experience and constant focus on meeting all delivery requirements. Our rapid prototyping capabilities have also received particularly positive feedback – we frequently go from “Print to Part” in 10-15 business days! Please Contact us for further details regarding Cast Urethane Pulleys!